I feel like I’m beginning to find a rhythm. Monday through Thursday, I study with a purpose. Fridays, I catch up on personal chores; things that didn’t get accomplished during school days. Then Saturday or Sunday I explore. Today I visited the “Cotswold,” a geographic region of southeast central England known for it’s 400+ year old stone cottages, serene farmland views and a few other little dittys like Bath and Stonehenge. The entire area is absolutely endearing and while I was looking for a way to do justice to this national treasure, I happened upon this excellent video. It tells the story better than I ever could, thus the “know when to fold ’em” title. In case you’re looking around one day and I seem to have disappeared, it may be that I’m here. I’ve decided to buy this one. Hope you like it, and please come to visit me when you’re in the area. Okay, I’m buying this cottage just about as much as I’m buying my favorite ski chalet in Crested Butte and my favorite adobe beauty in Taos. But at least dreamers keep themselves entertained, right? There was something else I learned about while driving down miles and miles of winding roads today. 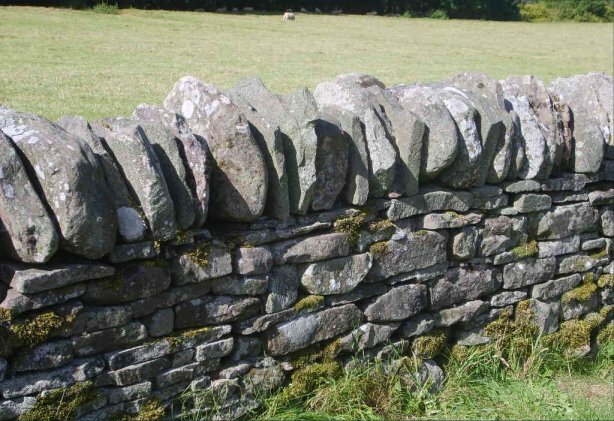 I learned that “back in the day,” when farmers had live-in help, they had these peasants build scads of the stone fences we now see everywhere there are farms in England. However, over the last 50-75 years or so, they’ve fallen more and more into a state of disrepair. Simply put, it’s an economy issue. There is a certain length of wall that IS being rebuilt, in spite of the cost. We drove by it today. The wall is approximately 3/4ths of a mile long and will take the team of masons approximately two years to rebuild the entire thing. It will cost an estimated 500K GBP, or $750,000 US dollars. One man works an entire day and gets approximately three meters finished. The reason for this is because: a) it’s hard work and takes a long time, but also; b) they’re deconstructing the old wall for materials at the same time. What level of love and commitment does it take to endorse a project like this? How about fund it? How about BUILD it? It this comparable at all to the love or commitment it took to work over a period of more than three hundred (by some estimations) to build Stonehenge? How about the 250 years to build the Abbey in York? I guess my question for you, and for myself tonight is this: Do you plan and commit to projects or to life missions knowing full well that they’ll never be finalized in your lifetime? If so – – why, or why not? Previous PostDay 25: Song Time! + Inspiration for AslanNext PostDay 27: An “Advert” Equally Cool as Toy Story? Perhaps. See for Yourself. Great article, Kelly. Mom says that we are still planting trees that we will never see fully mature. I would add that your generation certainly will see them as grown trees, though. Why plant them: well, see, the preceeding sentence and add to that the enjoyment of watching it grow now. Would you like me to plan a tree by your adobe home in Taos?